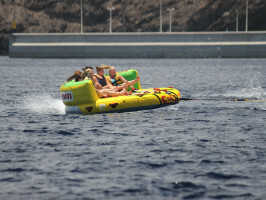 Enjoy a fun water sport. 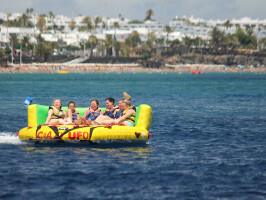 Relax and hop on-board a Crazy UFO. Driven by a boat, you can feel the speed as you glide over the water having fun with unexpected twists and turns. 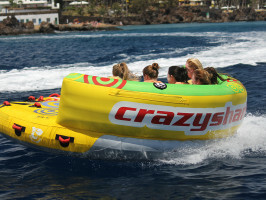 Crazy UFO, the newest water sport, guarantees 10 minutes of laughs and adrenaline. What’s more, with capacity for five people you can enjoy the experience with friends and family. 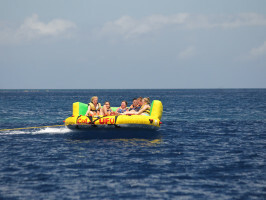 Ever imagined a thrilling water ride in the comfort of a sofa? Crazy UFO is suitable for people of all ages and has a qualified team on-hand to help you in English and Spanish. 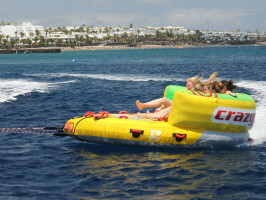 Simply choose one of the available locations (Puerto del Carmen or Playa Blanca) and prepare for adventure! Meeting point: Playa Chica, Paseo Barrilla in Puerto del Carmen and Marina Rubicon Port in Playa Blanca at the diving centre. Start/opening time: Daily at 10am. Others: For clients staying in the Playa Blanca area, we recommend using our diving centre located at Maria Rubicon port, Playa Blanca. Participants must be aged 10 years or older. Children aged under 18 years must be accompanied by an adult, age limited to 10 years.